Meteor Vineyard is as jaw-dropping as its Cabernets. Senior editor James Molesworth is Wine Spectator's lead taster for California Cabernet Sauvignon. He recently returned to Napa Valley for more visits with top wineries. And don't miss our Q&A with James on his Napa Cab eureka moments, his scoring philosophy, and what he's up to when he's not tasting wine. Andy Erickson has some street cred. As the consulting winemaker for Dalla Valle and Mayacamas, he has his hand on two of Napa Valley's benchmark estates. He consults for a handful of other wineries as well, all while working on his own Favia label with his wife, viticulturist Annie Favia. In 2005, Andy got a call from Barry Schuler, the former AOL chairman who had built a house and planted vines on the east side of the valley—20-plus hilltop acres—and called it Meteor Vineyard. Andy and Annie liked what they saw right away. "We loved the fruit," Andy says. "But the fact was, there was no Coombsville at that time. So, while the fruit was different from the beginning, our mindset was still on Napa blends at the time, not a specific AVA first." As Andy and Annie worked in the area over the years, they bought a 7-acre vineyard with Sauvignon Blanc vines and worked that. As friends Paul Hobbs, Agustin Huneeus Jr. and Tom Farella all developed or started their own Coombsville projects, the couple got to know the area more and more. "Annie was working with a Chardonnay vineyard next to Farella's that was going into Pahlmeyer," says Andy, "and that fruit was just amazing, even though we thought it should've been planted to Cabernet." Convinced of Coombsville's potential, Andy and Annie made their move. In 2014, they bought the remaining piece of the former Carbone family estate, a former mixed cattle, wheat and walnut operation that had been broken up over the years. 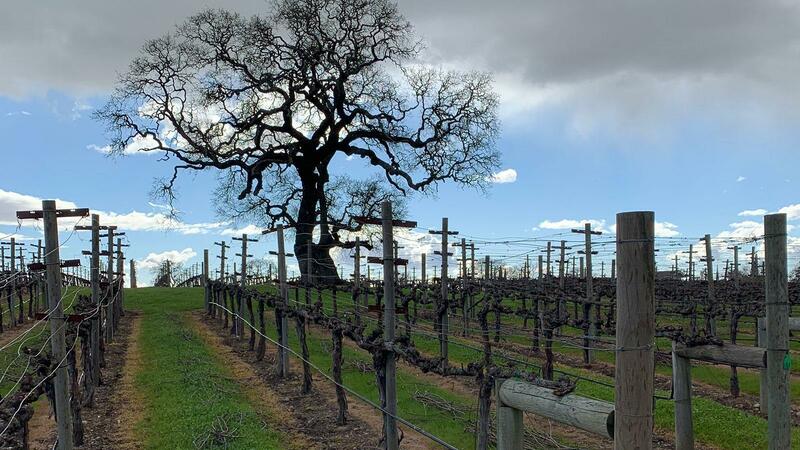 The 6.5-acre parcel, with a historic house dating to 1886 and some 75-year-old walnut trees, is located next door to the Faust vineyard. The couple sold the 7-acre vineyard they'd bought a few years earlier to finance the new property. They've since renovated the house, including adding a small barrel room in the basement. In that cellar, Andy draws some 2018 Meteor Vineyard samples from different clones of Cabernet Sauvignon. The clone 337 sample offers an intense beam of cassis and raspberry fruit with a racy feel and finish, while the clone 4 sample has a flash of herb, then a blacker fruit profile with a more compact, gravelly back end. Clone 7 offers crunchier acidity and more energy, with a savory hint. All will be used to make the Coomsbville blend, one of four Cabernet-based wines under the Favia label (there are two each from Oakville and Coombsville fruit, with one Cabernet Sauvignon–dominated blend and one Cabernet Franc–dominated blend from each AVA). A short vertical of the 2013 through '16 Cabernet Sauvignons from Coombsville shows both the AVA's character as well as the differing vintage profiles. The 2013 Favia Cabernet Sauvignon Coombsville is very, very intense, with waves of currant preserve and tar and a deep, smoldering feel on the finish. It's a huge wine, but with terrific focus and detail. The 2014 shows the more expressive aromatic profile this vintage has, with sage and tobacco notes leading off before blackberry and cassis notes take over, ending with a charcoal edge. The 2015 is tight, encased in itself: A very straight wine in feel, it's dense and ripe, but tightly drawn today, without the expression of the '14 or the energy of the '16. The 2016 is another gorgeous wine, and a rival to the '13, with polished fruit allied to grippy tar and charcoal notes. It's another big wine that still manages to move athletically. The Favia label is on the boutique side of the scale, with just 350 to 500 cases made of each of the four Napa reds, all retailing for $175 (there is an additional 1,000 cases spread across three Rhône-style bottlings from Amador County fruit). But as Andy explains, that small size allows for a level of detail that he couldn't adhere to at a greater scale, similar to Farella's approach. "I was working with Bob Levy at Harlan and he told me I could make a lot of very good wine, or I could make a little bit of great wine," Andy says. "I decided I want to make a little bit of great wine."